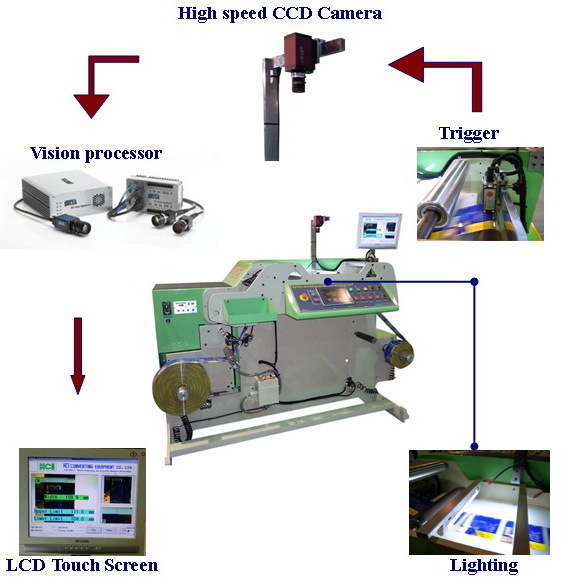 Shrink Sleeve Width Measuring System(Sleeve Eye) - HCI Converting Equipment Co., Ltd.
Sleeve Eye inspection system is designed exclusively for in line inspection of shrinkable label. It is capable of capturing continuously images of label with its US made high speed HD CCD camera. Couple with images processor, the system can instantly display the width of each label on the screen. Sleeve Eye inspection system is very versatile and it can also be installed on other machinery such as seaming machine and rewinding machine. Operators can now perform width inspection without the use of ruler. Simply enter the upper and lower limits of the width specifications, the system will beep and store the images of bad product once out of limits situation occurs. Consequently, the operator can take appropriate remedial actions to improve product performance. 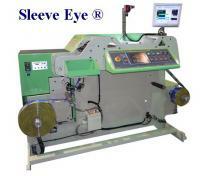 Sleeve Eye is also capable of providing still images of each label for printing quality inspection. This camera system replaces the Stroboscope. It can also enlarge images for enhanced-inspection task such as checking the distribution of seaming on the sleeve of the label. Fast and accurate dsplay of label width. Do away with manual measurement. Provide still images for printing quality inspection by operator. 100% inline providing non stop, continuous and instant inspection. Ensure quality standard of label. Reduce bad quality products. Reduce machine down time. Increase productivity. Inspection system is simple and requires low maintenance cost.